Thank you God for the things I have. Help me to learn to appreciate their value. Thank you for the things i don't have. Help me so that acquiring them does not become my goal. Thank you for the things I've lost. Show me how losing them can become my gain. Thank you for the people around me. Help me grow old with those who love me. Mature through those that don't, and understand the meaning of both. I keep this picture framed in my home--a reminder, not only of the incredible journey I took up the mountains of Haiti, but also to be grateful for everything that i have been blessed with in my life. It is so easy to focus on what we have or don't have, and we are so easily consumed by the desire for more, the incessant need to "keep up with the Jones' that we quickly forget what's really important. My house is small (1200 square feet), and old (over 50 years), and most of our belongings are hand-me-downs. We don't buy anything if it is not on sale, and forget about going out to dinner or to the movies--we can't afford it. But when I look at this picture, I feel so grateful for everything we do have. We may not have a big, newer house, or expensive belongings filling our rooms--but how many people have no more than a dirt floor to sleep on? We have healthy food to eat--how many children have only "mud cookies" to eat? We have quality, comfortable clothes to wear--How many have no more than the clothes on their backs? We are healthy, we have love, we have everything we need. I held a sick infant in my arms. She had no family to love her. I watched a mother receive the news that her child was dying. in a community whose people have so little, I watched as villagers in spotless, white clothes, sang hymns to the God they had entrusted their lives to. Thankful, not only for the things they have--which is nothing compared to the things we have here, in America--but also for the things they do not have. Are you thankful for the things you have, or do you spend your energy trying to get newer, better, more? Are you thankful for the things you don't have, or do you spend your prayer time asking God to give it to you? Are you thankful for the things you lack? For the things you've lost? Are you thankful? I look at this picture. I read this prayer. How can i be anything but? 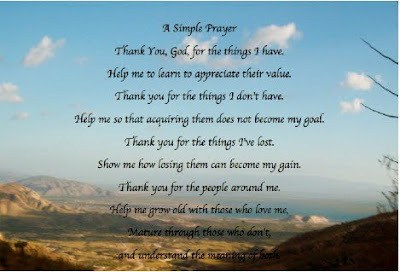 This is a beautiful simple prayer, and I thank you for sharing it. I did share on my Facebook, with a link back here.